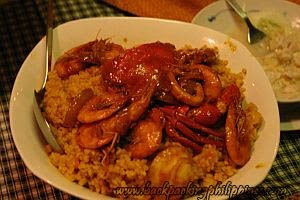 Due to Tutubi's insistence, he was able to persuade his officemates to eat out at the famed La Vista del Mar restaurant on the seafront of Zamboanga City due to information from their driver that they also offer Zamboanga's sought after curacha, a certain species of sea crab endemic in the waters around Zamboanga peninsula. Going to the place from Garden Orchid Hotel was quite a long drive since it's quite far. Checkpoints were everywhere and security was tight due to the presence of American troops participating in the Balikatan (shoulder to shoulder) exercise, a military exercise between US and Philippine soldiers. Picture of La Vista del Mar's last remaining curacha as shown by the waiter on a basin. 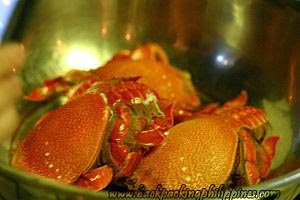 The curacha is a crustacean found only in the area around Zamboanga peninsula. Curacha is the Chavacano word for the crustacean that looks like a crossbreed between a large sea crab and the big spiny lobster that's also meaty and delicious! Best to cook it minimally to preserve its unique exotic taste. Tutubi was surprised that there were no other people except a group of foreigners, tourists that is, who came to explore the area in spite of the travel advisories. The tourists seem to enjoy their stay where most people dare not tread out of fear even if they haven't been there. 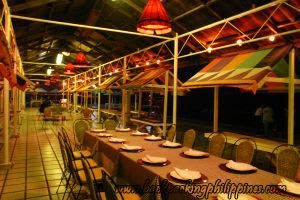 Comments/Review: La Vista del Mar's place is cozy with ambiance of Zamboanga truly captured with great vista of the sea. Menu prices are cheaper than that of Hai San Restaurant but can't give you actual prices since Tutubi didn't shoulder the bill. Adjacent to La Vista del Mar is Maria Clara Art Gallery. Also proximate is the Yakan Weaving Village where you can buy handwoven products of Yakan people of Basilan. Board a jeep in the city (pueblo) with signboard Rio Hondo (a Muslim village of houses on stilts built over water). The place is near Yakan Weaving Village. curacha or sometimes called cucuracha is one of my favorite food there. in fact cucuracha also means cockroach for the chavacanos because it looks like a cockroach. it is a deep sea crustacean and try to research how they capture it (other than breeding it). interesting. Mindanao is on my list of places to visit...but quite at the bottom... due to security reasons. It is difficult to know exactly how safe or unsafe a place is. Some people say it is no problem some others advice not to go. The world is so big... there are still so many places to discover in the Philippines that I feel I don't need to go to the "dangerous" places first. But I admit... those crabs look good! Yummy crabs!!! :) funny how they call the crabs as curacha. Hehehe. I've always loved crab and you're tempting me Tutubi! 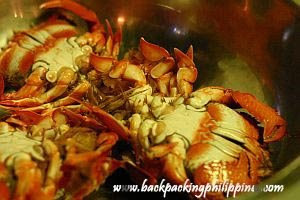 Crabs sauteed in butter with lots of garlic, chili powder and oyster sauce. Yum Yum. How did you find the Curacha? Did you like it? Medyo malayo kasi yang "La Vista Del Mar" kaya konti lang tao. The Alavar's Resto also serves Curacha within the city. Sea crabs, eh? Well whaddayaknow. I might like it. Was pretty happy to get myself a plate of fresh fish today. A universal delight. i have a question, can you get curacha in manila? vlado and toni, they usually target high profile individuals and it's ok within the limits of zamboanga city. the "action" you hear in the news is far from the city proper. kyels, so you love crabs, eh? lawstude, so you can also be a cook besides a lawyer, eh? ferdz, iba lasa nya e pero masarap sya. still longing for alavar's ginataang bagoong? I like seafood. Had some yesterday. how much is the entrance and cottage fee? 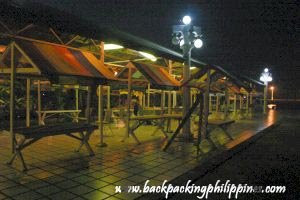 you should try the food served in Alavar's Restaurant next time you visit Zamboanga. i still ask my mom to send me the alavar's sauce often, it's one of a kind. also, you may want to visit sta. cruz island next time. it has pink sand.